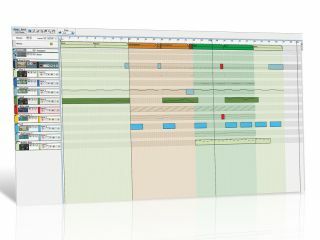 DAW features such as Reason's Blocks mode make it easier to structure your songs. The most common and accessible pop song format to evolve over the last 50 years is made up of the holy trinity of verse, chorus and middle 8. Referred to as ABABCBB, in practice, it goes like this: intro/verse1/chorus1/verse2/chorus2/middle 8/chorus 3/chorus out. With modern production tricks, this classic skeleton is beginning to evaporate into a simpler framework containing just a verse and a chorus, with variety being created by the sounds of the parts rather than the parts themselves being different. In other words, there's more sonic variety than musical variety. The use of filters, in particular, has encouraged repetition of parts that would otherwise become boring. There are many variants of this classic pop structure. Another is ABCABCBC, containing verse1/bridge1/chorus1/verse2/bridge2/chorus 2/instrumental (usually based on the bridge)/chorus 3. Some other notable structures are completely different - Somewhere Over the Rainbow, for example, has the structure AABA: verse 1/verse 2/bridge/verse 1. The AABA form has variants like AABABA, ABAB and ABABA, where some sections become instrumental. A rarer form is AAA, one example of which is Bridge Over Troubled Water by Simon and Garfunkel. Here, the same verse is subtly varied over the course of three repetitions, each time growing in intensity. Other interesting and more old-fashioned examples include ABAC (listen to Moon River, where the last section veers beautifully off into an emotive ending) and ABCD (as in Rodgers and Hammerstein's You'll Never Walk Alone). Of course, what all this 'ABABC-ing' ought to tell you is that, like making cocktails, there are classic song structures, but there's always room for innovation. It's a good idea to stick to the tried and tested options if you're unsure, but follow your heart if you feel you can pack an extra emotional punch by adding a new ingredient. Whatever structure your song features, if you want it to be played on the radio, without doubt the most important thing is to get to the chorus in less than a minute, and ideally in less than 30 seconds. If you want to pitch your songs to the industry, you are completely wasting your time if you take longer than a minute to get to the chorus. Many of the people you have to impress to get your song recorded and released are not particularly open-minded or indeed culturally aware. They are listening only for the sound of mouse clicks on the download button and the purr of their new Porsche Cayenne. If you really want to improve your chances, you can always try starting the song off with the chorus. It doesn't have to be the full-blown version as it might appear later in the song - it could be a cappella (vocal only) or just vocals and beats. Having said that, very few artists will ever get a five-and-a-half-minute, modern-day Bohemian Rhapsody through the net. In fact, we might never have heard that phenomenal track if Capital Radio DJ Kenny Everett hadn't actually physically barricaded himself in the studio while he broke all the BBC rules to play it. Thankfully, the listening public agreed with him. 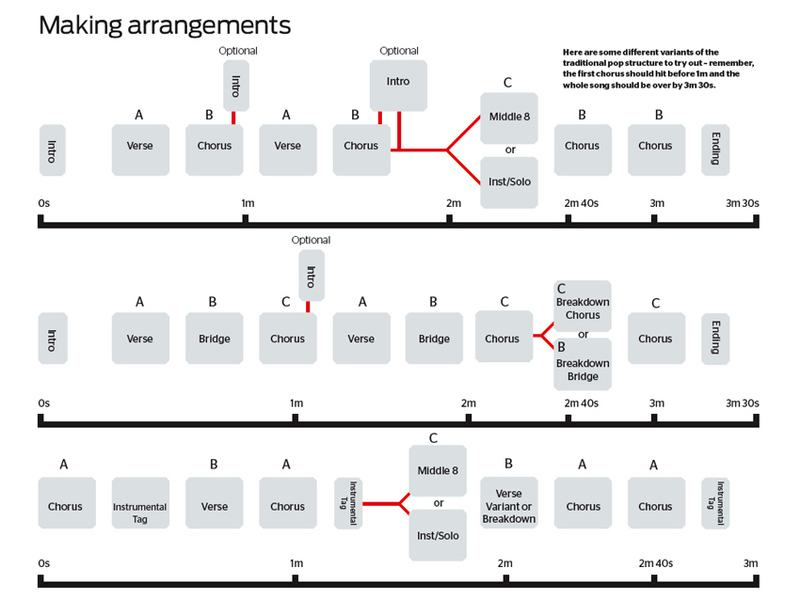 Here's a pictorial guide to some common song structures (click to see it full-size).